Spearman's Rank-Order Correlation - A guide to how to calculate it and interpret the output. What values can the Spearman correlation coefficient, rs, take? The Spearman correlation coefficient, rs, can take values from +1 to -1. A rs of +1 indicates a perfect association of ranks, a rs of zero indicates no association between ranks and a rs of -1 indicates a perfect negative association of ranks. The closer rs is to zero, the weaker the association between the ranks. Where d = difference between ranks and d2 = difference squared. as n = 10. Hence, we have a ρ (or rs) of 0.67. This indicates a strong positive relationship between the ranks individuals obtained in the maths and English exam. That is, the higher you ranked in maths, the higher you ranked in English also, and vice versa. where df = N – 2, where N = number of pairwise cases. How do you express the null hypothesis for this test? H0: There is no [monotonic] association between the two variables [in the population]. H0: There is no [monotonic] association between maths and English marks. How do I interpret a statistically significant Spearman correlation? It is important to realize that statistical significance does not indicate the strength of Spearman's correlation. In fact, the statistical significance testing of the Spearman correlation does not provide you with any information about the strength of the relationship. 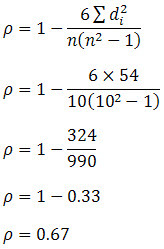 Thus, achieving a value of p = 0.001, for example, does not mean that the relationship is stronger than if you achieved a value of p = 0.04. This is because the significance test is investigating whether you can reject or fail to reject the null hypothesis. If you set α = 0.05, achieving a statistically significant Spearman rank-order correlation means that you can be sure that there is less than a 5% chance that the strength of the relationship you found (your ρ coefficient) happened by chance if the null hypothesis were true.